Are you interested in Marxism? Want to learn the basics but can’t get required readings done in advance? The Revolutionary Students Movement (RSM), together with its parent organization Proletarian Revolutionary Action Committee (PRAC), are hosting a series of Communist Schools on the topic of Marxism-Leninism-Maoism (MLM). These sessions are meant for beginners with no prior knowledge of MLM. In addition, we encourage group study. Therefore no reading of material in advance is necessary. We will take turns reading the material to be studied aloud. 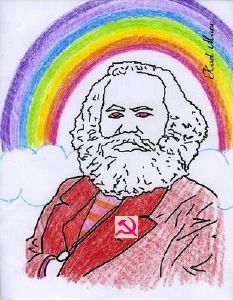 On Sunday March 10th from 5PM-7PM, join the Revolutionary Students Movement at the Coffee Time opposite Lansdowne station for our bi-monthly communist school. The topic for this session is Lenin and Leninism. Copies of the material will be distributed to you when you arrive. 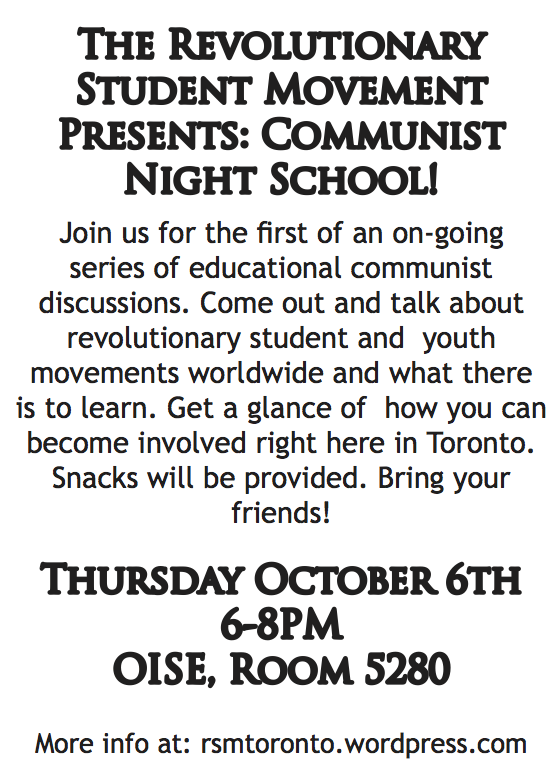 The Revolutionary Students Movement in Toronto will be hosting a Communist Night School on Thursday, November 17th, from 7PM to 9PM, at Innis College, room 313. We invite you to the second session of an ongoing series of free educational discussions on various aspects of Communist politics and culture where we will debate questions of identity politics and liberalism. Let’s discuss how and why the so-called ‘death’ of communism and the rise of neo-liberalism has obscured our analysis of race, gender and sexuality as an economic phenomenon. This session, we will be focusing on sexuality. Topics will include the gay movement, including its accomplishments and failures. We will be looking at where the movement has made tactical errors. We will also examine some of the communist backlash against homosexuality as an identity and as a practice, and deconstruct the pseudo-science that underly uncritical Marxism’s attacks on homosexuality. Finally, we will do a brief overview of the history of homosexuality from a Marxist perspective. Attendees are invited to go through the reading as much as possible and take part in discussions. We will have three presenters, who will break down the reading into digestible components. Did we mention there will be snacks?